Ye Olde Green Wave Forum • View topic - Parry Nickerson...Good God! Post subject: Re: Parry Nickerson...Good God! A new mock draft from Pro Football Focus has Nickerson going in the 2nd round to Atlanta. Like Tanziel and Nico before him, Parry will be missed. 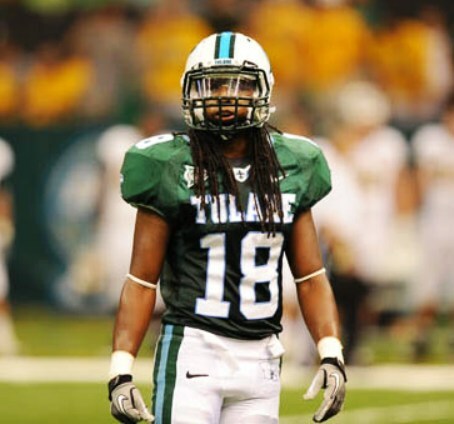 Only Tulane guy in the draft. 6th round seems low. In other news: Tanner Lee to Atlanta in the 7th! Go Atlanta! The Athletic has Parry going in the 4th round and Ade in the 6th. Good luck to them both. Roll Wave! Best of luck to him!!!! Make us proud! Party ended up going in the 6th round to the Jets. Jets fans on twitter seemed to be pretty excited about the pick. Parry already getting first team reps at practice. Glowing article from the Athletic. Lionel Washington quoted and Tulane coaching praised. Roll Wave!!! Admittedly mostly click bait, but Parry made ESPN's perfect NFL roster as a backup DB. Interestingly, Michael Pierce, yes THAT Michael Pierce, is a backup DT and has an astonishingly high Madden rating. It's just like my NCAA video game predicted!